A broad sample of divinities, grouped together according to holy trinities or production technique or presented individually for their aesthetic and technical quality, complete the journey through the Egyptian Museum of Barcelona. Thousands of gods were worshipped in Egypt under the pharaohs. These cannot be structured in an all-encompassing genealogy, since theological systems grouped together a small number of divinities. The most common formula was the triad. Triads consisted of a main god, his wife and their child. However, the Egyptians also configured complex theologies onto which they transposed their concept of the cosmos and of creation. The most notable of these include those prepared by priests in Heliopolis, Hermopolis, Memphis and Tebes. One of the most characteristic facets of the religious worship of the ancient Egyptians was their worship of certain animals, which is clearly reflected in their art. These divinities were always related to some process of observation of nature, transforming these beings into the incarnation of God. Thus, the hippopotamus, with its large stomach, was associated with pregnant women, while the falcon, with its powerful flight that took it close to the Sun, was worshipped as a celestial and solar being. 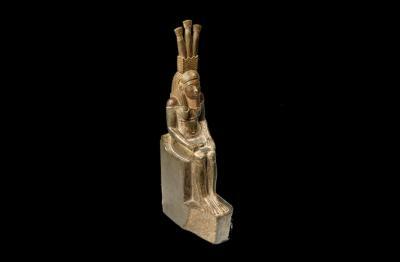 Figure of the goddess Neit. Bronze and gold. 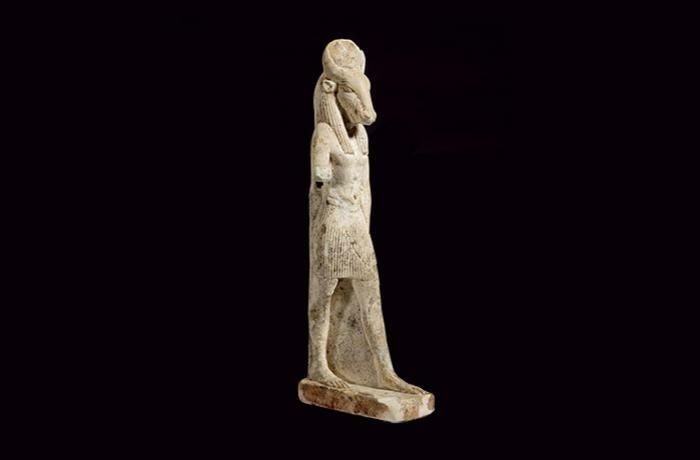 26th Dynasty (664-525 B.C.). 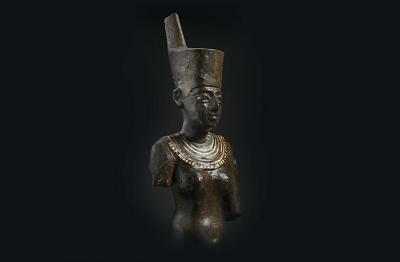 The most characteristic attribute of this goddess, who was from the city of Sais, was the red crown of Lower Egypt. Considered one of the few female creators, she was also the inventor of fabric and, in her funerary role, provided the deceased with the possessions and shroud for their mummy. The Greeks referred to this goddess as Athena. Statue of the god Hapy. Wacke. The Ptolemaic Period (304-30 B.C.). Upper part restored. In the androgynous figure of Hapy, the Egyptians saw the personification of the growth of the Nile and the benefits of this growth. His opulent stomach, generous breasts and papyrus plants in his hair are consistent with his status as the god of fertility. 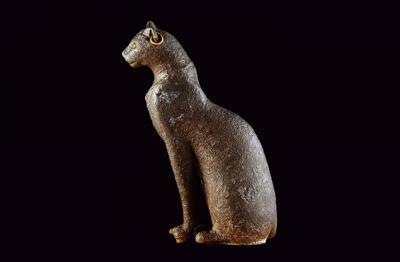 Representation of the cat goddess Bastet. Bronze. 26th Dynasty (664-525 B.C.). Cats were considered divine protectors due to their ability to hunt dangerous animals (rodents, serpents, etc.) However, Bastet only had friendly, maternal connotations but could also become an angry and cruel being, which led to her character being confused with that of Sacmis, the lioness goddess of war. Statue of the goddess Tueris. Granite. Late Period (715-332 B.C.). This curious divinity with the body of a hippopotamus, the feet and arms of a lion, human breasts and the hide of a crocodile was the patron saint of women during pregnancy and childbirth. With its fierce appearance, it protected women and children from malign beings. Amulet of the bull Apis. Glazed dough. 26th Dynasty (664-525 B.C.). While various Egyptian gods could adopt the form of a bull, Apis would become the most powerful and famous. 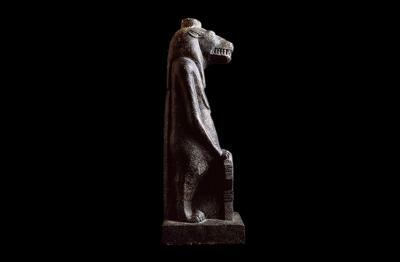 Each year priests selected the animal they considered to be the incarnation of God, which would be mummified and buried with great opulence. This divinity of fertility and strength was worshipped with particular devotion in later periods.